At Krech Exteriors we believe that a more educated client will make more informed decisions. Ultimately these decisions will benefit them by speeding up the window replacement Minneapolis process and eliminating any misunderstandings between our team and the homeowner. For that reason we have assembled a glossary of terms pertaining to the replacement window process, and hope you will look through it before your next Minneapolis window replacement project. Aluminum-clad windows and doors: Windows or doors of wood construction covered on the exterior with extruded (E-Series/Eagle windows) or roll-formed aluminum. Has a factory-applied finish to deter the elements. The extruded aluminum adds structural capabilities to the product and helps eliminate warping and damage through handling. Astragal: The center member of a double door, which is attached to the fixed or inactive door panel. Auxiliary frame window: Our version of a fixed, direct set window frame where glass is set directly into a frame without a sash. Is used in the creation of geometric and radius windows. Classic Divided Lights: Our version of simulated divided lights without the spacer bars between the glass. This economical option features fixed exterior bars and removable interior wood grilles for easy cleaning from the inside. Clerestory window: A venting or fixed window in the upper part of a lofty room that admits light to the center of a room. Decorelle® glass: Our exclusive decorative glass collection. 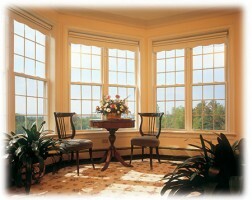 Available in many styles, Decorelle glass consists of leaded, beveled, grooved, textured and colored glass, to name a few. Finger-jointing: A wood end-joint formed by a set of interlocking fingers, coated with adhesive and meshed together under pressure. French sliding doors: A sliding door which has wider panel members around the glass, thus giving it the appearance of a hinged French door. Hinged French doors: Hinged door(s) which have wider panel members around the glass. LVL: Laminated Veneer Lumber – A combination of many pieces of veneered lumber glued together to give added structural capabilities. Often used in window or door frames. Simulated divided lights: A method in constructing windows or doors in which muntins are fixed to the inside and outside of the insulated glass panel to simulate the look of a true divided light. Modern Divided Light in our terminology. Stile Lug or Horn: One of two extensions of the sash stiles to support the upper sash of a double-hung window.